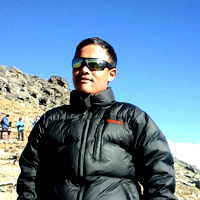 I am Subaraj Magar from Lukla. I have been working since 2010 as a trekking guide for the Everest region, I have done uncountable trekkings of Everest region, Everest Base Camp, Gokyo Valley Trek, Jiri to Everest Base Camp and also Phaplu to Everest Gokyo. Peaks are climbing Island, Lobuche, Mera, and Kongde Peak, I know every tea houses and places of these areas, most of the teahouses are of my relatives’ workers as a cook and cook helpers.